Transoft Solutions Inc., developers of transportation engineering design software, has introduced a new version of AutoTURN, the vehicle swept path analysis software of choice for engineers, architects and planners. An industry standard for more than 25 years, AutoTURN is trusted in over 120 countries, including 95% of US State Departments of Transportation. 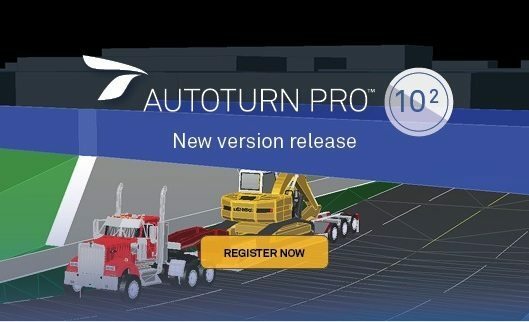 With version 10.2, AutoTURN users have a new option to perform reverse maneuvers for tractor-trailer combinations. Requested by users, “pushback reverse” provides more control over steering in reverse, resulting in more realistic results. Also, creating a new tractor-trailer combination is now even easier, with the ability to quickly combine different parts of vehicles in our database. AutoTURN’s already comprehensive vehicle libraries have been updated, including design vehicles from Australia, Bahrain, Canada, the Netherlands, UK and the United States. Users of AutoTURN Pro will also see significant enhancements to the software. AutoTURN Pro’s 3D clearance analysis capability is even more flexible, now with the ability to create independent 3D envelopes for vehicles and their loads. IntelliPath automation has also been improved. Users can simulate more detailed vehicle movements by adding waypoints. The software can also calculate the maximum possible speed on a given route. AutoTURN Pro Maintenance Assurance Program (MAP) subscribers will receive over 250 vehicle models based on manufacturer specifications, which can be used for accurate analysis and for creating attractive presentations in 2D and 3D. AutoTURN and AutoTURN Pro 10.2 are available for purchase in English, French, Spanish, Italian and German. AutoTURN MAP subscribers have already been sent their free version upgrade. Transoft Solutions, Inc. develops innovative and easy to use software for transportation professionals. Since 1991, civil engineers and technologists, architects, and city planners across federal agencies, State DOTs, airport authorities, cities, ports, and infrastructure consultants have come to rely on Transoft’s field-researched design solutions. Transoft’s engineers work closely with the world’s leading agencies including AASHTO, ITE, TRB, TAC, Austroads, and CROW to develop highly specialized applications serving over 30,000 users across 120 countries. Transoft Solutions is committed to providing best-in-class customer support through its offices in Canada, Sweden, the United Kingdom, Netherlands, Australia, Germany, India, and China, enabling professionals to design with confidence. For more information on Transoft’s range of civil design, aviation, and vehicle simulation solutions, visit transoftsolutions.com. Follow us @transoft.